French authorities have found themselves mired in controversy after Le Figaro leaked a government-commissioned report that looked into a safer alternative to fracking for shale gas, banned in France. The confidential report, which says that France’s shale gas deposits could be easily removed without the well-known method of hydraulic fracturing, commonly known as fracking, was published by Le Figaro newspaper. Until Tuesday the report was apparently buried by officials, it said. The paper was reportedly commissioned back in 2013 by then-Minister of Industrial Renewal Arnaud Montebourg, who stood for clean mining for shale gas. It was completed in 2014 and passed to the government, which repeatedly said that mining for shale was not a possibility. The potentially game-changing report suggested that the country’s shale gas deposits could be exploited with the use of "clean technology" of non-flammable propane, as thus there wouldn’t be any need for the controversial practice of fracking. Non-flammable propane has the advantage over water as it can be recovered more easily and be reused. The technology doesn’t require water or additional materials and is more environmentally-friendly. It points out, in detail, how France could take advantage in terms of growth, employment, industrial competitiveness, energy independence, and advocates a first experiment in micro-drilling in Ile-de-France and in the southeast of the country. Montebourg confirmed the authenticity of the report to Le Figaro, though reportedly refused to further comment on the matter. In the meantime, French Ecology Minister Ségolène Royal took to Twitter to respond to Le Figaro’s story, saying that the government had "nothing to hide." “Shale gas extraction is no longer a valid topic. Let’s do energy transition,” she wrote. Réponse au Figaro : rien à cacher. Les gaz de schiste ne sont plus d'actualité. Faisons la #transition énergétique. Investissons ENR . Social media exploded over the leaked report by Le Figaro. “Another fine example of industrial sabotage environmentalists and lack of courage of [France’s President Francois] Holland!” wrote Agriculture & Environment, a monthly newsletter. Alpine geologist Charles Lamiraux, who used to work for the Ministry of Ecology, Sustainable Development and Energy, blamed the “green lobby” for burying the report. Political editor of the Le Journal du Dimanche weekly, Dominique de Montvalon, has called the leaked report a “hit by Montebourg” in a Tweet. Montebourg frappe: voici que surgit, à la Une du Figaro, le "rapport enterré" sur les conditions d'extraction en France du gaz de schiste.! France had “technically recoverable reserves of 3.8 trillion cubic metres” in 2013, according to a study by the United States Energy Information Administration. 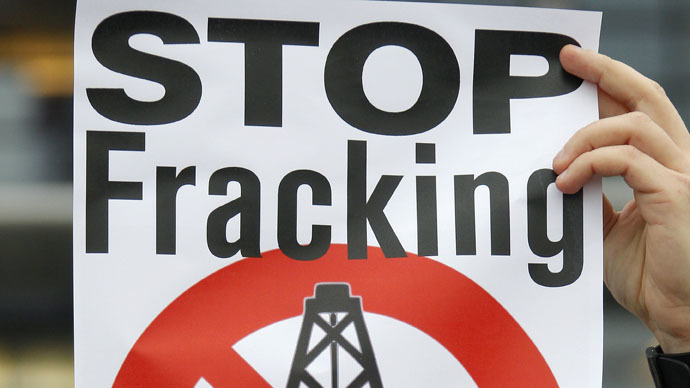 Fracking was banned in France in 2011 after public pressure. The move was upheld in 2013 following complaints by US-based Schuepbach Energy. The company told French court that the law was unfair after having two exploration permits revoked due to the ban. In March Energy Watch Group, an international network of scientists and parliamentarians, released a report, saying that the impact of fracking on the environment and health in Europe is disproportionate to the gains derived from this drilling method. “Unlike in the United States, which is the only country conducting fracking at a commercially relevant scale, the method cannot achieve a sufficient result from extraction in Europe,” president of Energy Watch Group Hans-Josef Fell said. The report warned that according to current estimates there will be a disproportionate amount of money spent on a method that can only supply Europe with energy for a decade. Fracking includes drilling for fossil fuels using water, sand and chemicals under high pressure through drill holes to blast open shale rock. Opponents argue it has been linked to groundwater contamination, heightened earthquake activity, exacerbation of drought conditions, and a variety of health concerns for humans.